When I started making batons in 2007 it was important to learn how and why we as conductors choose the batons we use. I then started my own research project by which nearly 400 conductors were measured and given 5 batons to choose from. What we learned is that nearly 90% of the time conductors chose a handle that was about the size of their thumb and a stick length that was about the length of their forearm. From that point forward, we have fitted thousands of conductors with our system yielding much success. We build our batons to order to allow for each musician to determine for themselves where the balance point should be based on the size of their hands, how they were taught, what types of groups they conduct, and many other factors. As you go through this process, you may want to have a ruler, paper, and pen handy. 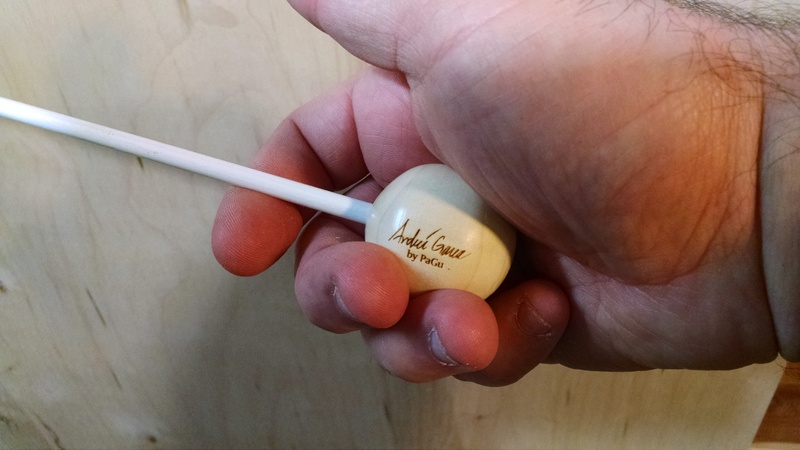 The contour, length, and width of a baton handle are important for comfort. PaGu Batons offers a wide variety of handles that are designed for different hands and grips. Use our measuring system to find the right handle for you. FYI: In 2014 we introduced our first flat-spot baton which is changing the way we think about the shape of a baton handle. When conductors feel a flat-spot baton, they choose them 10:1 over all other models. Side note: If you find a shape you like, but the size is not quite right, you may choose our Maestro Service which allows you to design or change any handle to your specifications. Use our fitting system to help you choose the correct shaft length. If you plan on using the baton for groups less than 40 members or a choral ensemble, subtract 1” (2.5 cm). If you plan on using the baton for groups larger than 70 members, then add 1” (2.5 cm). 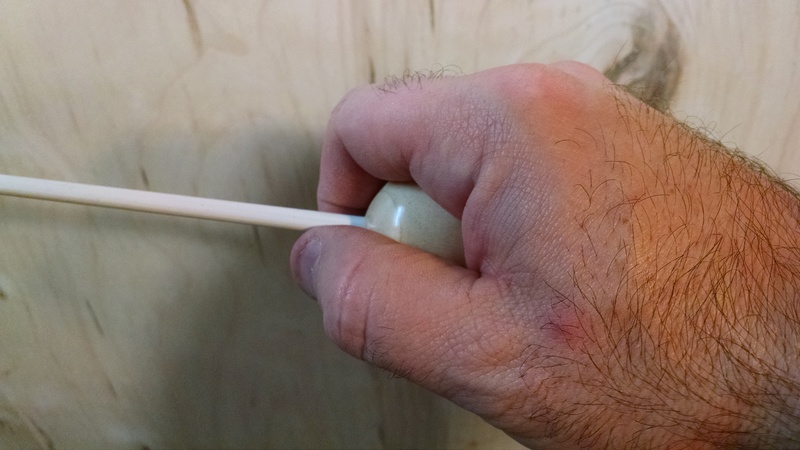 Perhaps the most critical part of building a baton is the balance point. This will give the conductor the perception of a baton being “heavy”, “light”, “responsive”, “dead”, and other adjectives we’ve heard over the years. Ultimately, the balance will directly impact the music making experience for the conductor. You don’t want to think about the baton, you just want to be an extension of yourself. At PaGu Batons, we specialize in balancing the baton at the optimal spot for complete control allowing the conductor to be free from thinking about the baton when making music. Tension Free - 1” (2.5 cm) up the shaft to put all the weight in at the tip of the baton. This for folks that like to tuck the handle deep into the palm which pushes the fingers further up the shaft. It is also great for those who hold the baton basic fulcrum but want a lot of weight at the tip. 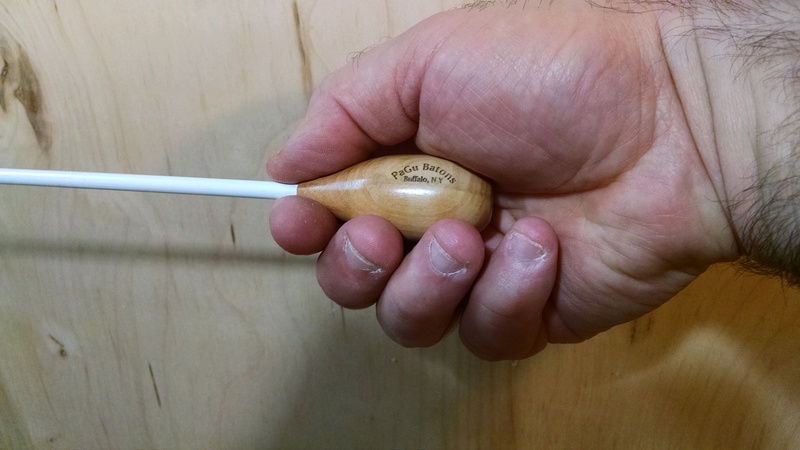 Basic with tip weight - 1/4” (6 mm) up the shaft for folks with large hands (1” or wider thumb width) who hold onto the shaft and want it balanced on their index finger. OR conductors with smaller hands (less than 1” wide thumbs) who like a bit of tip drag when holding basic fulcrum. Basic Fulcrum - balanced where the shaft meets the handle. This is the most common configuration. If you grip the handle behind the collar this will give you a little tip drag. 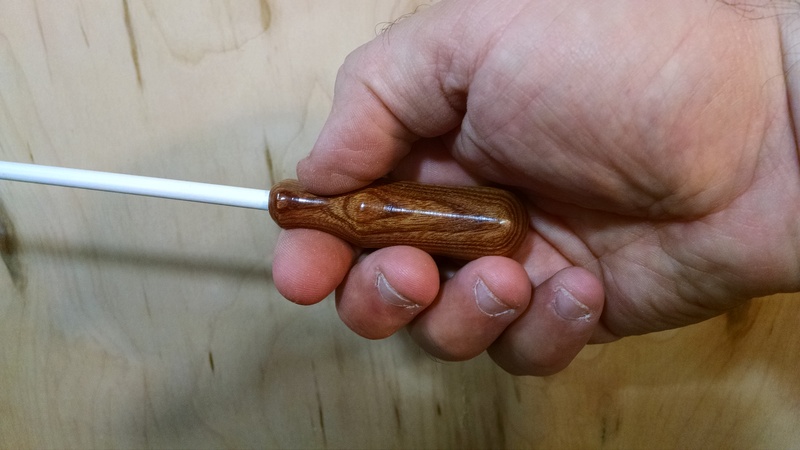 Behind the collar - 1/4” (6mm) back from the shaft onto the handle is for those who hold the handle and want the instrument balanced on their index finger or if you hold it on the shaft it will put some weight in the palm of your hand making the baton feel heavy. Palm weighted - This will put all the weight of the instrument in the palm of your hand. No tip weight. We provide our conductors the opportunity to select the type of wood they like for their handles as a guide for us when crafting the batons as to the color and grain that they would like. However, the wood is used as a counterbalance for us when making the baton. So, if the wood chosen will not balance correctly we then select a different wood that will look as close to the one chosen. It’s all about getting the right balance and feel. 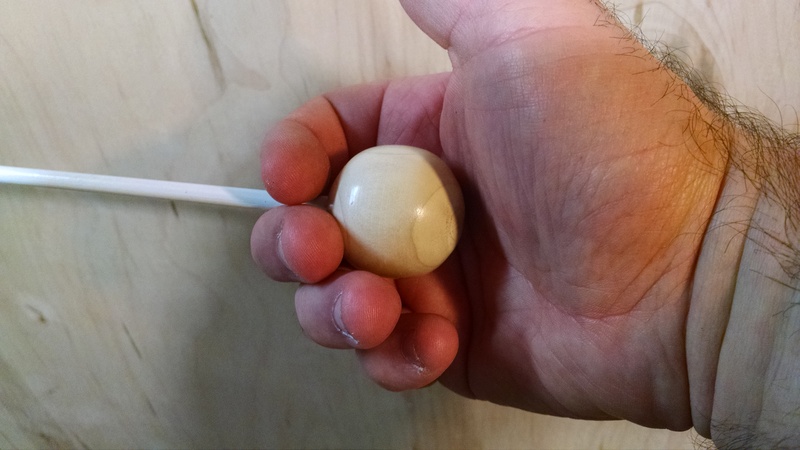 Natural Maple wood- 3/16” (4.7 mm) diameter wood shaft tapered only 4” (10 cm) from the tip. Most visible in theatrical lighting. White high gloss stained maple wood shafts- 3/16” (4.7 cm) diameter wood shaft tapered only 4” (10 cm) from the tip. Classic, durable finish! Carbon Fiber- ⅛” (3 mm) diameter carbon fiber rod painted with a special primer and high gloss enamel. Most commonly used by wind ensemble directors and teachers who are concerned about breaking their batons. FYI: There is no difference in the weight of these materials. The weight of the baton shaft is perceived by the balance alone. Which one you choose is based on personal preference. At PaGu Batons we have chosen to use finishes that feel warm in the hand which are less likely to be slippery as hands sweat. For this reason, we choose not use cork handles or polyurethane finishes.